Children’s eating habits in Italy: European kids eat junk food too. The Death of Italian Cuisine? Kids in Rome are eating just as much junk as kids in America. The Coca-Cola may be classic, but its presence at an Italian meal isn’t. Adapted from The Lost Art of Feeding Kids: What Italy Taught Me about Why Children Need Real Food, out now from Beacon Press. American soft drinks have been available in Italy for a long time. There are some Italian versions too, but Italians didn’t drink them with meals until recently. A variety of nonalcoholic aperitivi such as Gingerino, Sanbitter Rosso, and Crodino come in small bottles that hold about half a glass of liquid, and you can order them at a bar in the afternoon instead of having a glass of prosecco or franciacorta (although it’s beyond me why you would ever want to have something instead of prosecco or franciacorta). They are bitter and slightly sweet, and they are meant for adults, not children. But in the summer of 2011 at one of our favorite pizzerias in Rome, I was surprised when the waiter asked my 6-year-old son, Nico, if he wanted a Coca-Cola with his pizza. Nico said yes, and I said no. (I said it much louder, so I won.) It never would have occurred to him to order a soft drink; he’s used to drinking water with meals, as other Italian children did until very recently. Until the waiter offered the possibility of something sweet, he had been content with water. But now I had an angry child on my hands, and the only way to win back his attention over dinner was to promise that he could have sugar and lemon on the bowl of fresh strawberries that he intended to order for dessert. Later, I asked the waiter why he offered a soft drink to a child. I wondered if it was some kind of promotion, but he said no, that he’d noticed that more children were asking for Coke with their pizza and that they seemed to like it. Italians really like to see children enjoy their meals. 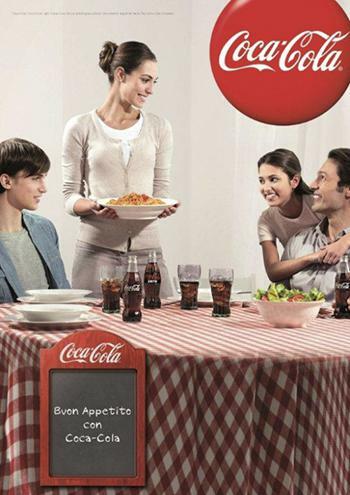 Coca-Cola actually had a campaign in the summer of 2011 to encourage Italians to drink Coke with their meals. This might not seem radical to Americans, but this is the land where people drink water or wine at mealtime. The campaign wasn’t specifically targeted at children, but it was so omnipresent that no one of any age group could have missed it. In the coffee bars, there were special menu deals offering a sandwich with a Coke, or a salad with a Coke, or a slice of pizza with a Coke, or a bowl of prepackaged, microwaved spaghetti with a Coke. In Rome some ads were designed to look as though they were from the 1950s and showed people sitting at a table drinking Coke with their food, a view of the Colosseum behind them. In North America everyone is talking about the link between soft drinks and obesity, but you don’t hear as much about it in Europe. Europeans have developed food cultures that include the good with the bad and so they are less fearful of foods we might deem dangerous. The pleasure of food has always been part of its nurturing quality. This has left them vulnerable to advertising that portrays junk food as wholesome family food, and sweet drinks as something to make the little ones happy. There’s an innocence here when it comes to these sugary drinks that reminds me of North America in the 1970s. Families arrive at the beach lugging giant bottles of cola and orange and lemon soda. I saw a woman at the beach pouring Coca-Cola into her baby’s bottle–the baby wasn’t even walking yet. I can only imagine that she had no idea why she shouldn’t give a sugar-loaded, caffeinated soft drink to a baby. In Italy sweet soft drinks are perceived as children’s drinks, and there’s an implicit trust that no one would make something for children that was actually bad for them. As childhood obesity has risen all over the world in the last few years, and as Italy’s rate of childhood obesity has now reached one in three, I can see that what has changed is the introduction of processed and fast foods. Industrial food is often marketed in Italy as traditional, local, and part of the culture. Mulino Bianco uses bucolic imagery of perfect rolling hills and farmland to sell processed foods and snack cakes. Its parent company, Barilla, even runs the Academia Barilla to “defend and safeguard Italian food products.” The company talks about the diversity and richness of Italian products and offers cooking classes to educate people in the art of Italian gastronomy using its own processed foods. McDonald’s launched a version of local food with the controversial McItaly burger in 2010. The company promises that the ingredients are all Italian, including the beef. Somehow it managed to get the ministry of agriculture to endorse its American-style, fast-food hamburger dressed with an all-Italian artichoke spread and Asiago cheese, and present it as part of Italy’s great food traditions. The agriculture minister posed for photographs wearing a McDonald’s apron and holding up a beef patty. The ministry backed the McDonald’s venture, he said, because it wanted to defend the “Made in Italy” trademark and promote the taste of Italy, particularly to young people. “We want to give an imprint of Italian flavors to our youngsters,” the minister said at a press conference. The founder of Slow Food, Carlo Petrini, denounced the venture in an open letter published in La Repubblica pointing out that trying to reduce Italian flavors into a “taste” for globalization does not promote Italian food traditions; instead it standardizes and homogenizes the taste. He also expressed concerns about how this would further industrialize food production in Italy, as the chain had already created a much larger demand for ground hamburger meat and would also require large quantities of standardized crops. In European countries with a history of amazingly diverse food cultures, children are eating the same industrial foods and suffering the same problems. For Italians, as for other cultures, the solution is all around them in the fresh fruit and vegetables that are so abundantly grown here. And the traditional recipes are so appealing it seems a shame not to look to them, rather than to food products and hamburgers, to form the basis of any new Italian gastronomy. For a while, one news item had Italians thinking a little more about their eating habits, and I hoped it would encourage a return to traditional eating. The Food and Agriculture Organization of the United Nations published an analysis of the diet in the Mediterranean region from 1962 to 2002 finding that it had “decayed into a moribund state.” Mediterranean countries were eating about 30 percent more calories by 2002 than they had been 40 years earlier. The richness and distinctness of the diets were disappearing as people consumed mostly salt, fat, sugar, and refined carbohydrates. They were eating too much meat and too many processed foods. As culprits, the study pointed at the growth in supermarkets, changes in the way food was distributed, and the facts that more women were working, people were eating in restaurants more often, and people were getting less exercise overall. After the study was published, there was a flurry of news items about overweight children and their clueless parents who innocently fed them fast food and ice cream snacks. People began to talk about choosing healthy snacks for their children, but more often than not, those snacks came wrapped in packaging bearing claims of being natural, wholesome, and even traditional. Though Nico had a wonderful, home-cooked, two-course lunch prepared for him at school, he had to take his own food for the merenda, which is what Italians call the morning or afternoon snack. I was looking forward to finding out what wonderful foods Italian parents prepare for their school-age children. I was really disappointed to learn that for the most part they send their kids to school with processed snack cakes and special children’s yogurts. When I complained about it to a Canadian friend in Paris, she sent me the menu from her daughter’s nursery school so I could see in writing—because otherwise I might not have believed it—that this French school gave the children cornflakes with chocolate milk for a snack. I started asking people what children used to take for the merenda before processed foods came along, and I inadvertently stirred up wistful memories among adults of the snacks they ate as children, things like rustic bread drizzled in olive oil and sprinkled with a little salt and eaten along with a piece of fruit, of garlic- and oil-infused vegetables left over from the previous night’s dinner and mashed between two chunks of bread, and of frittata sandwiches made from eggs and whatever else was left over from dinner. For a sweet treat, children would sometimes be given thick slices of bread spread with jam or, to be really decadent, butter with sugar sprinkled on top. A ritual that was once practical and mostly healthy has become a daily opportunity for children to eat sugar and chemicals. In the past, a jam tart or a piece of cake was a special and infrequent treat. Now children eat factory-made cake every day–sometimes twice a day–and they expect it. Italian parents and grandparents have nostalgic feelings for their wonderful homemade snacks, but children growing up in Rome today would likely find a square of last night’s polenta in their merenda box to be a big disappointment. Having a child here completely changed my perspective on Italian culture. I started to see that the markets were pretty much only being used by me and the little old ladies. There is an entire generation of adults who don’t really cook much anymore. They buy everything in the supermarket and feed their children frozen pasta dishes and soups made with powdered bouillon. I wanted to believe that Italy was more sophisticated than North America, and that Italians were more discerning about the food they ate. I didn’t want to believe that they were so rapidly descending into the food mess that I thought I left behind in Canada. Weren’t Europeans supposed to be more selective when it came to food? Weren’t they supposed to resist all this? Food traditions evolve over time. They are the collective ways that a culture has learned to feed itself with what’s available. The problem is that what’s available in Europe now includes huge amounts of junk food and soft drinks. This is how a child ends up drinking Coke with his pizza in a pizzeria in Rome. Adapted from The Lost Art of Feeding Kids: What Italy Taught Me about Why Children Need Real Food, by Jeannie Marshall. Reprinted with permission from Beacon Press.